What a better way to beat the heat this summer than by enjoying a nice cold soft drink. It’s also a great excuse to learn a little chemistry! We all know that carbon dioxide is what puts the fizz in soda pop, but why not some other gas, say nitrogen for example? First a bit of history. In 1767, Joseph Priestley discovered a method of making carbonated water by hanging a bowl of distilled water above a beer vat at a local brewery. Priestley found that water treated this way had a pleasing taste, and he offered it to friends as a refreshing beverage. In 1772, Priestley published a paper that described dripping sulfuric acid onto chalk to create carbon dioxide gas, then dissolving it into a bowl of agitated water. This process would be improved upon by others and eventually sold to pharmacies for commercial use. 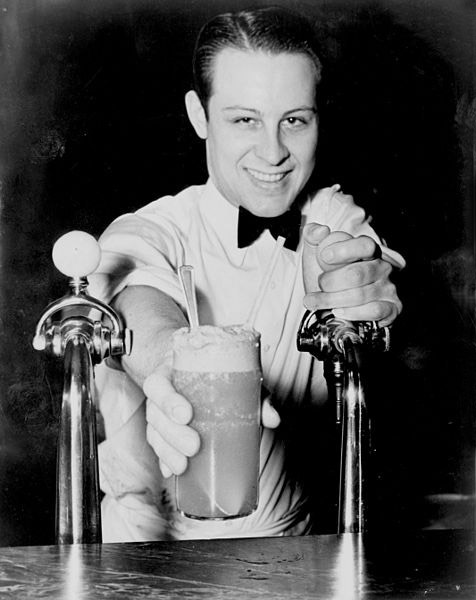 Before long, pharmacies were adding flavors to their soda water and the soft drink was born. Now back to our original question. Why carbon dioxide instead or nitrogen or oxygen? Carbon dioxide is used in fizzy drinks because it’s more soluble in water than nitrogen or other potentially suitable gases. At room temperature, you can dissolve about 1.75g of carbon dioxide into a liter of water, compared to about 0.02g of nitrogen per liter of water, and about 0.04g of oxygen in one liter of water. So, out of the readily available, nonpoisonous gasses in our atmosphere, carbon dioxide is by far the most soluble. Carbon dioxide dissolved in water at a 0.2–1.0% concentration and creates carbonic acid. This gives the water a slightly sour taste with a weakly-acidic pH of about 3.7 at normal bottling pressure. An alkaline salt, such as sodium bicarbonate, may be added to reduce the acidity and mimic the taste of natural spring water. This is how carbonated water came to be known as soda water, and is also the difference between seltzer water and club soda—the former does not have any sodium bicarbonate added to it.